Cheesecake is my absolute favorite dessert, so I’m always thinking about new ways to lighten up the flavors so I can eat it more often. 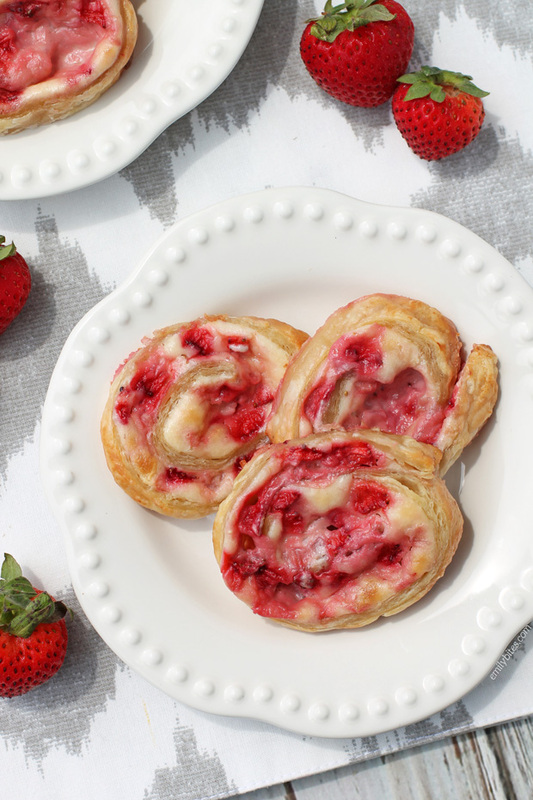 The neat thing about these Strawberry Cheesecake Pinwheels is that though I intended them to be a dessert (and that’s how I served them), they really remind me of fruity cheese Danish, so you could totally eat them for breakfast as well! The flaky puff pastry, creamy sweet cheese and fresh juicy strawberries are the stuff dreams are made of – my dreams, anyway! 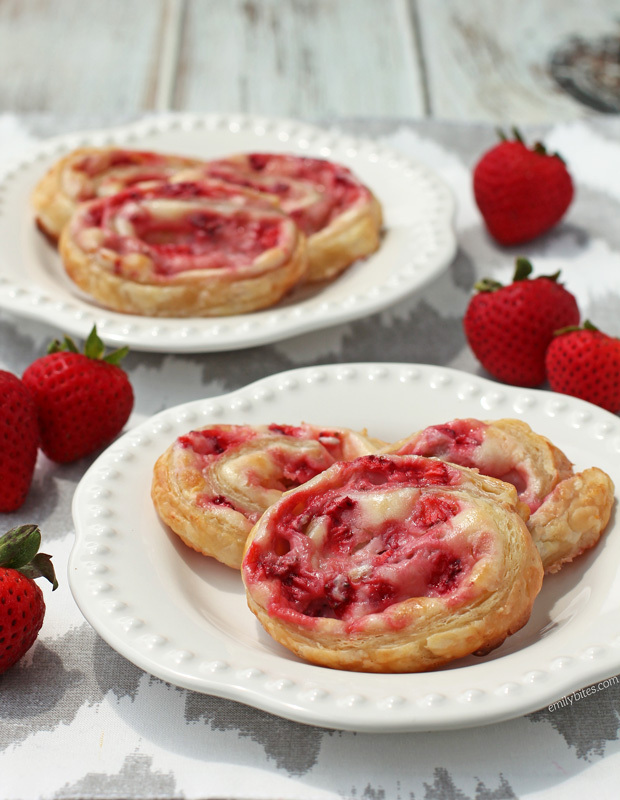 These Strawberry Cheesecake Pinwheels would be great for a party, but if you just want to make a few at a time you can easily slice a few off the roll once it’s frozen (step 3 in the directions below) and keep the rest of the roll frozen for later. At just 82 calories each, these pinwheels are the ideal sweet little indulgence. Looking for more ways to use puff pastry? Check out the Puff Pastry tag in my Recipe Index for delicious lightened up recipes for Pepperoni Pizza Pockets, Peach Basil Tart, Cheesy Spinach Pinwheels, Caprese Tarts and more! On a sheet of parchment paper (or a clean, dry surface sprinkled with a small amount of flour to prevent sticking) lay down your sheet of defrosted puff pastry. Using a rolling pin, roll the pastry into a 10”x14” rectangle of even thickness. Using a hand mixer or stand mixer, combine the cream cheese with the powdered sugar and the vanilla extract in a mixing bowl and mix until well combined. Use a spatula to spread the cream cheese mixture evenly across the top of the rolled puff pastry. 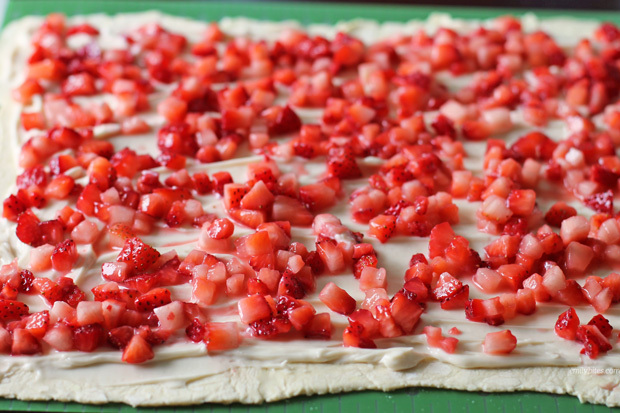 Sprinkle the strawberries over the top of the cream cheese mixture on the puff pastry. With the longer side of the pastry rectangle facing you, roll the pastry by pushing forward, wrapping the ingredients into a long roll. Once the pastry is completely rolled up into a big “log,” wrap it in parchment paper or cling wrap and place it in the freezer for 2 hours or until it’s easy to slice into circles. When you take the pastry roll out of the freezer, use a serrated knife to slice it into 24 even “spirals.” I find the easiest way to do this evenly is to cut the roll in half, then each of those pieces into quarters, then cut each of those pieces into thirds. Place each spiral onto the parchment lined baking sheet and bake them in the oven for 20 minutes or until lightly golden. These look amazing! Just made your Lemon Blueberry Muffins which were fantastic (and I’m not a blueberry fan). Can’t wait to try these! How do you use the divided sugar? Itseems to only go into the cheese mixture. What are the temperature and time instructions to bake these? I know you said they can be kept frozen until you are ready to bake, but was wondering if they have to be eaten immediately after baking? I was thinking about making these to take to a picnic and wasn’t sure if these would work. They don’t have to be eaten immediately! They’re prettiest the day you make them though. I wonder if this would work with something besides strawberries. My husband doesn’t eat them. Blueberries, maybe? Would it be possible to reduce the sugar? Seeing as the fruit is already sweet, 3/4 c may be too much sweetness for my family. Sure, feel free to tweak the recipe to suit your tastes! I made these tonight and they are fantastic! Thanks! Anyone try these using splenda or powdered erythritol? Maybe I’m not letting mine freeze long enough but mine were really juice when I cut them and collapsed causing me to only get 16 wheels, not 24. Hoping the second roll I’m leaving in the freezer over night will turn out better. Just made these and I’m OBSESSED!!!!!!!!!!!! Do you have any suggestions on reducing the point value? I am new to WW and don’t have a clue how to manipulate recipes?